Headaches are among the most common disorders of the nervous system. They can be extremely painful and effecting the daily life tremendously. One of the most severe types of headaches are cluster headaches. Cluster headaches are defined as a kind of unilateral headache (mostly around the eye) of extreme intensity. The pain can be unbearable for sufferers. An attack usually lasts between 15min and 2 hrs. The pain is so severe that many people develop suicidal thoughts during an attack. Therefore, these attacks are called “suicide headache” or “suicidal headache”. The attacks come in clusters of recurring attacks up to 10 attacks per day. Besides the usual treatment option available, the FDA (United States Food and Drug Administration) approved now a new device for the treatment of cluster headaches. It is a handheld noninvasive nerve stimulator. 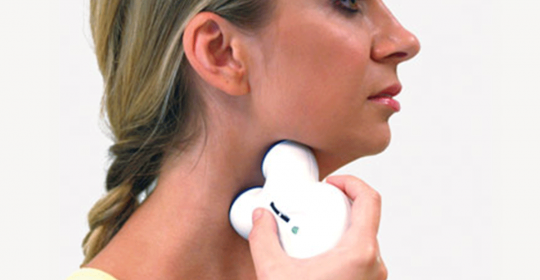 The stimulator targets the vagus nerve, thus reducing the extreme pain. It should be applied just when the attack starts. Two large studies could show that the device is effective, easy to use and safe. The devise showed to be effective in only up to 40% of cases. However, since the pain is described as one of the worst pains of the human body, this new treatment option brings new hope to sufferers. It is not yet clear if and when the device will be available on the UAE market. We will keep you posted.